I’ve been trying to locate this graphic for sometime now; ever since I saw it on the BBC programme Q.I. (Quite Interesting) I’ve been meaning to blog about it. 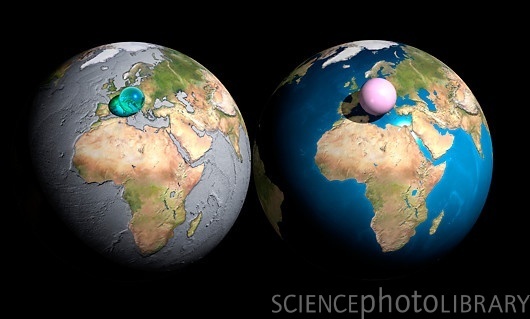 It is a comparison by volume, where the small blue sphere on the left is all the water on Earth, and the pink sphere on the right is all the air on Earth. The guy who designed this computer image, Adam Nieman, has really hit the spot in showing how finite resources both the Earth’s water and atmosphere are.